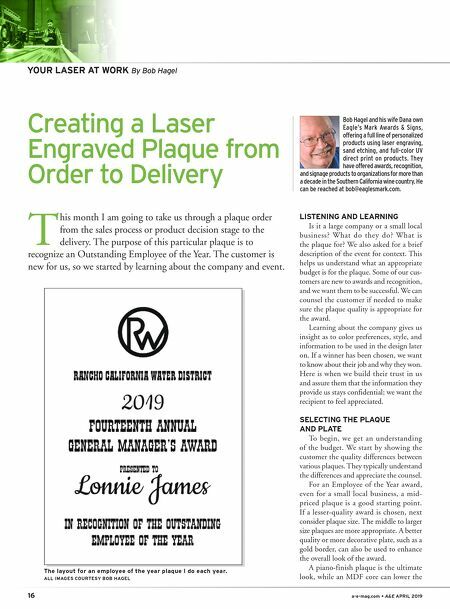 A&E APRIL 2019 • a-e-mag.com 17 Laser Engraving price to a mid-priced plaque. The plate can be more expensive than the plaque, so this next decision is key to meeting the budget. There is a wide selection of plates and many price levels that fit the desired look. We make it a point not to attempt to sell above the needs or absolute budget of our customers. Our clients know they can trust us to treat them fairly and not oversell them. This creates loyalty and an ongoing busi- ness relationship. This trust often results in future orders where the client asks us to pick out a product for them. IMPORTANT CUSTOMIZATION INFORMATION It's great when all the information needed for the plaque is available when the order is taken, but if the winner's name is not known at this point, that doesn't prevent me from beginning the design. We counsel our cus- tomers to use an award title. A good title can reduce the need for too many words of sentiment. We explain this is not a book, but an award. Most of the words should be said during the presentation of the award. Usually, the company logo is included. What seems to be most often forgotten by a new customer is the date. For an Employee of the Year, the year is often what is included; however, we have clients that like to use something like, "Presented on January 15, 2019 by Janet E. White President & CEO." This is considered formal and most often used by large companies. Our list to review with the customer includes: logo, award title, name, job title, department or division name, date, key descriptive words, goals met or performance, and theme (if there is one). Our order form for laser engraved projects. Many of our plaque choices. 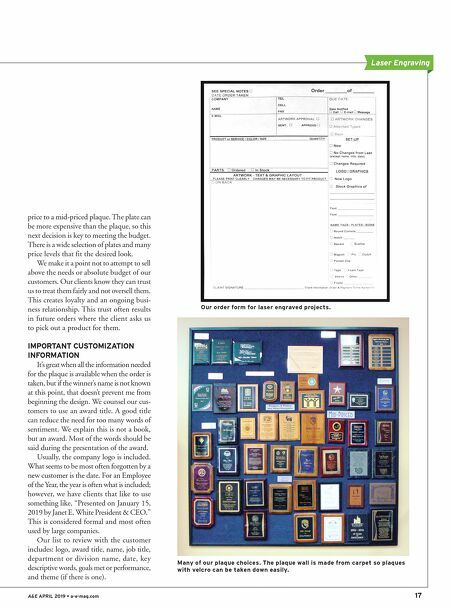 The plaque wall is made from carpet so plaques with velcro can be taken down easily.